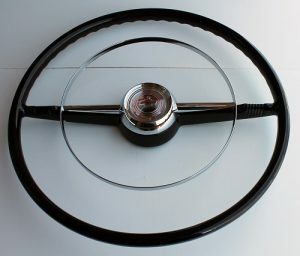 This 1953 Chevy Steering Wheel is a reproduction of the original GM steering wheel that was included on either the Belair or the 210 model 1953 Chevy. Originally they were produced in colors to match or compliment the color of your interior. 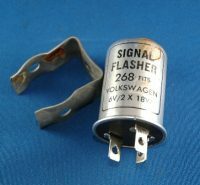 Listed here is a reproduction that is offered in Black only. This steering wheel did not come on the 150 model cars but could be used on a 150 with no modifications. This new wheel is complete which includes the wheel, chrome horn ring, plastic horn button and horn parts under the button that makes the horn work. The chrome horn ring for this wheel can be purchased separately in the site listed elsewhere. GM originally produced the horn buttons in colors to match or compliment you interior color. The reproduction Horn Buttons made today are clear and need to painted by you “on the inside” to match whatever color your interior is. The 1954 Horn Button has a Chevy Crest in the button versus the 1953 Horn Button has a Chevy Bowtie in the button. 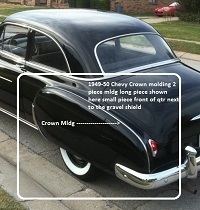 That is the only difference between the 1953 and the 1954 steering wheels listed here.